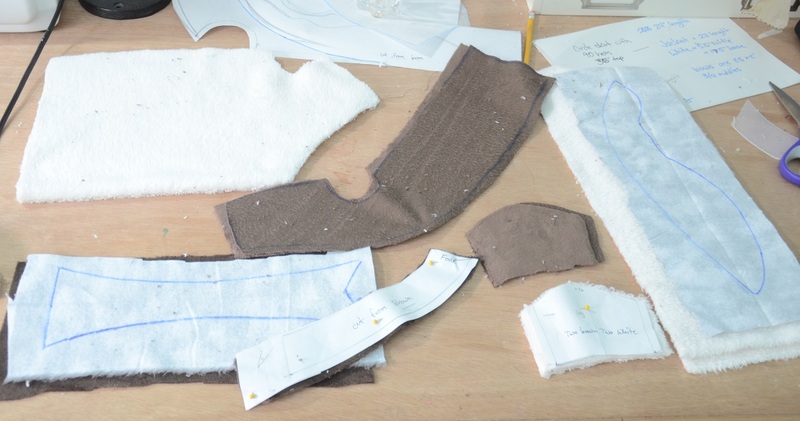 If you’ve been keeping up with my recent posts, then you’ll know about my current project – an Appa pajama set! Well this is a side project to that project, which is also a side project…it’s uhm, slightly confusing? To make sense of it all, I would like you to meet Momo! 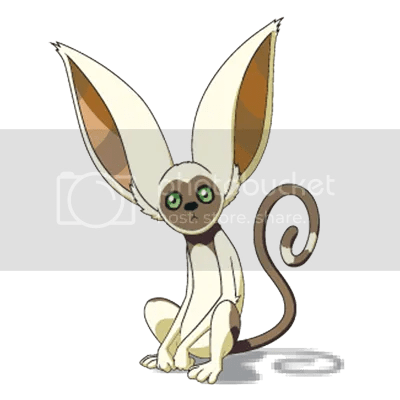 Momo is a companion to the main character in ATLA and joins the entire cast as they go on adventures. Momo is a flying lemur whose main purpose is looking adorable. When I was designing my hoodie I originally wanted the hoods to be interchangeable, allowing me to switch between sky bison and flying lemur. This idea was trashed moments later when I realized the markings of lemurs in ATLA are entirely different then the sky bison’s. 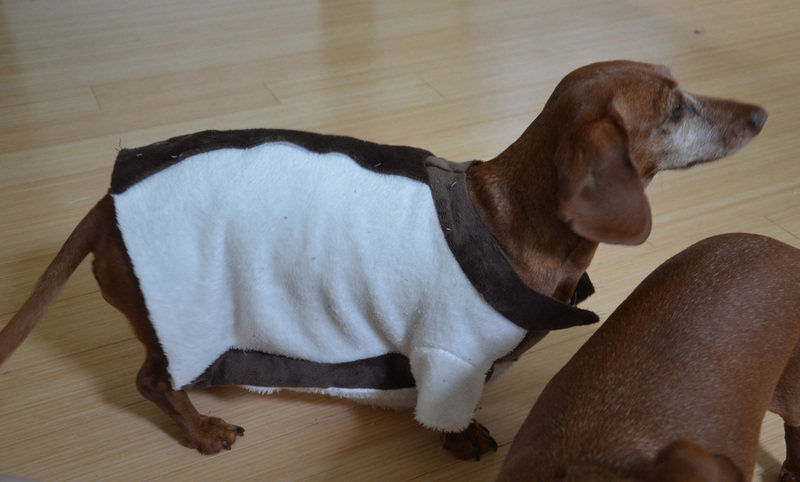 I mentioned this to my brother and he made an offhand comment about making a Momo hoodie for my dachshund Guinevere. It was a silly idea. The type that probably shouldn’t be taken seriously. 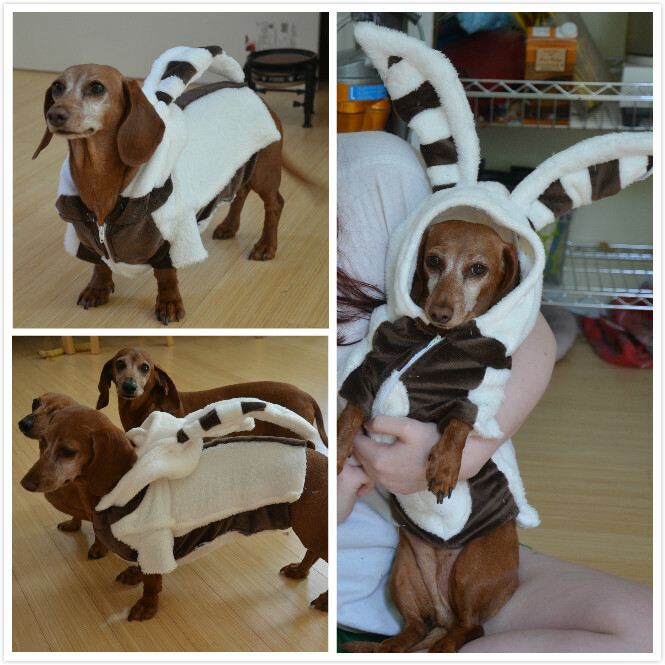 But I decided it was brilliant, and that my dog as in desperate need of a hoodie that would match mine. I used this handy reference sheet created by Nylak on Deviantart for reference, since getting consistent photos is really challenging. I did a whole bunch of marking sketches and sadly ended up having to drop the wings. I couldn’t figure out a way to make them work without looking silly. My first mock up was made by cutting apart an abandoned dog sweater we bought four years ago and never used. The mock up was a big failure, far too tight, impossible to get on. Mock up two wasn’t much better – it was too big and there was way too much space between her legs, and the neck gaped like crazy. I ended up tossing them both away and flat patterning it. 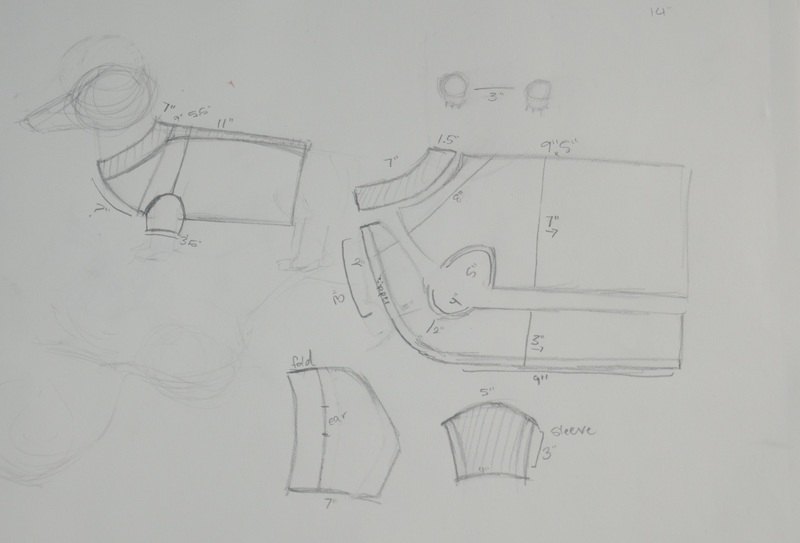 I took a whole bunch of measurements and did a lot of guesswork on a sketch. 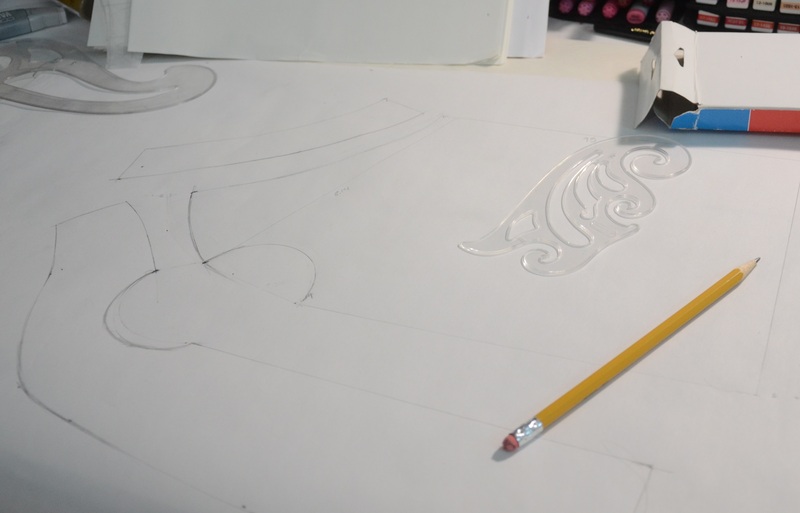 Then I got out a ruler, some newsprint, french curves, and a pencil. Which is apparently all it takes. Eventually it ended up looking like this. Which turned into a relatively successful mock up. 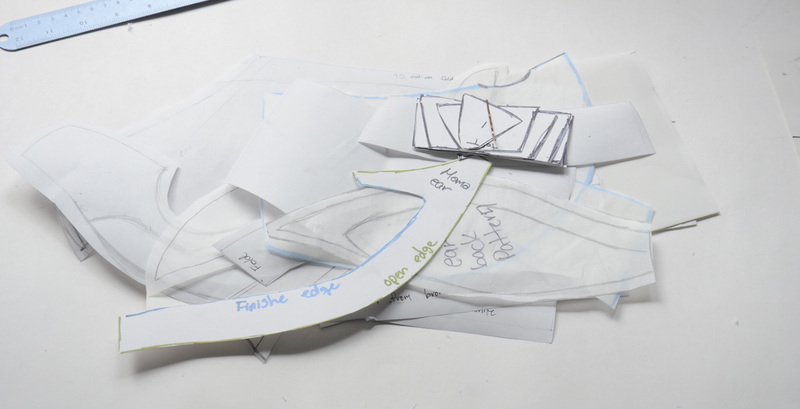 Sadly I didn’t photograph any of my mock ups, since they weren’t very exciting. 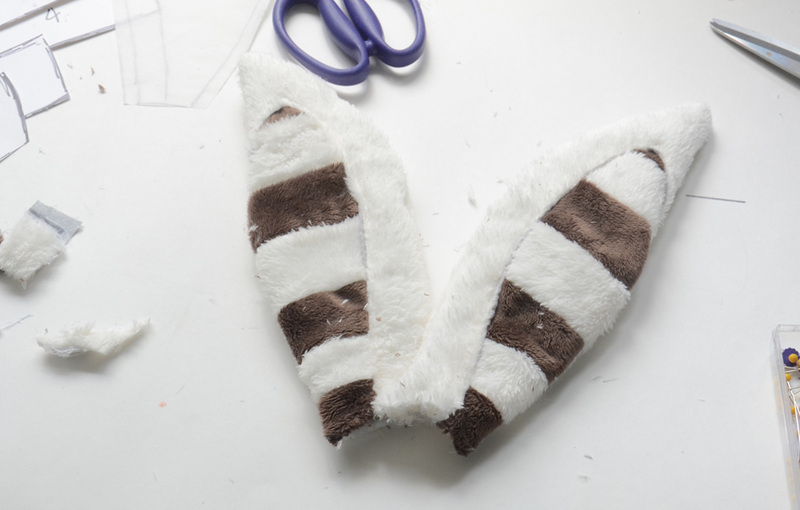 I made a few hood/ear mock ups, but this was the one I ended up basing my pattern off of. 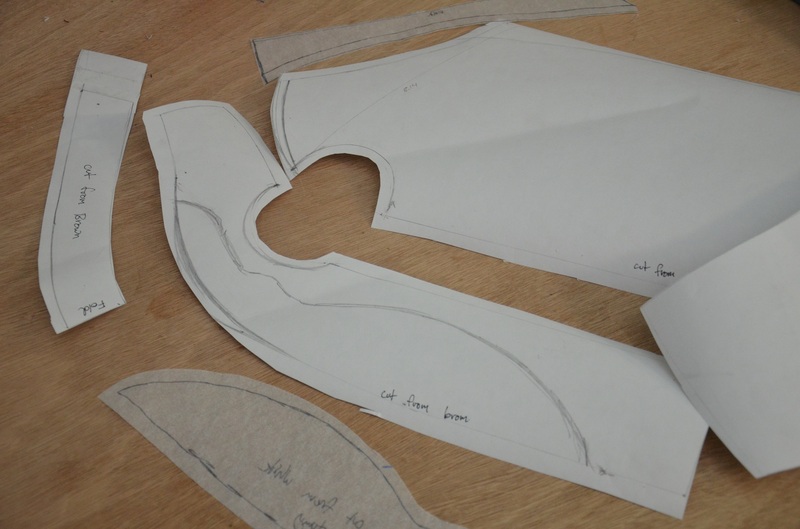 Fast forward an hour and I had a perfectly usable pattern for a lovely little Momo hoodie. Once cut out it looked like so! I started out by creating all the markings. 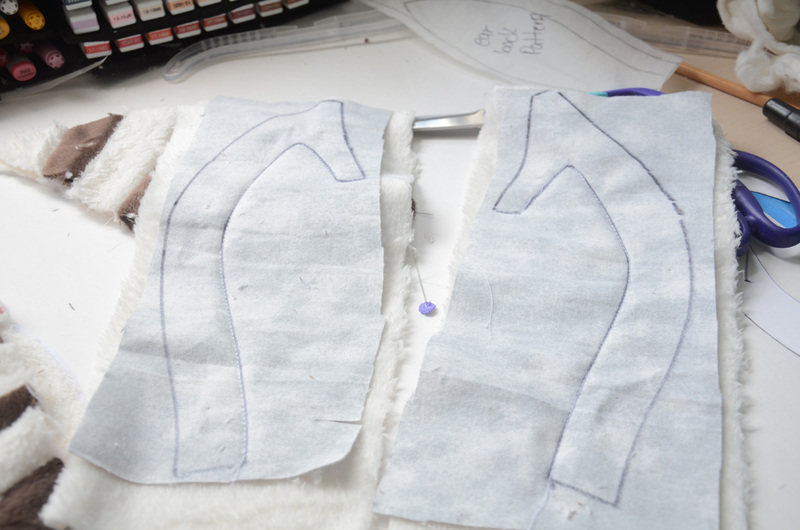 I used the same method that is talked about in part 2 of the appa pajama project. 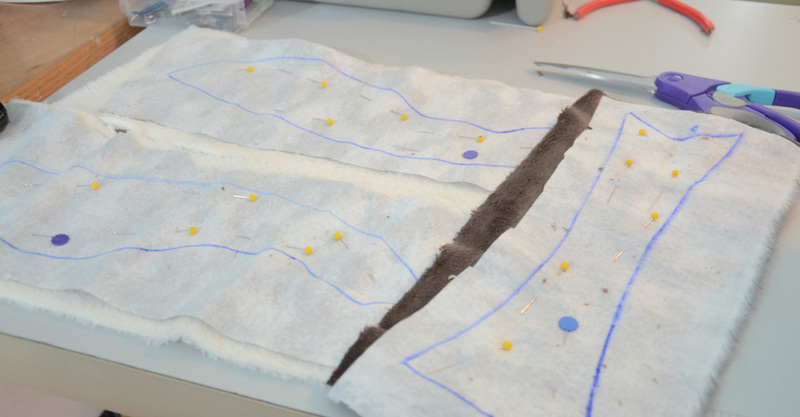 Lot’s of pinning, sewing things right sides together, fliping them right side out and topstitching em’ down. 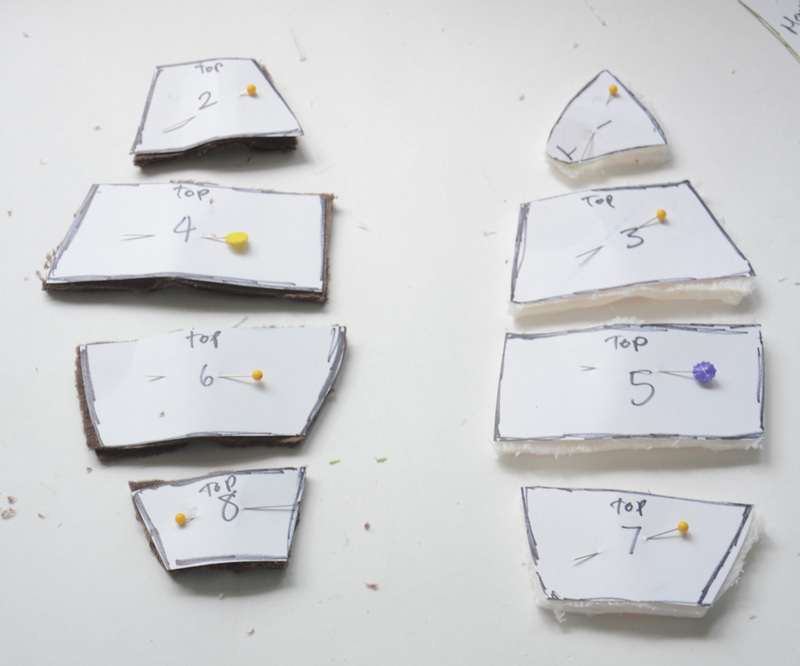 But it all starts with pinning. Then sewing and trimming the edges. 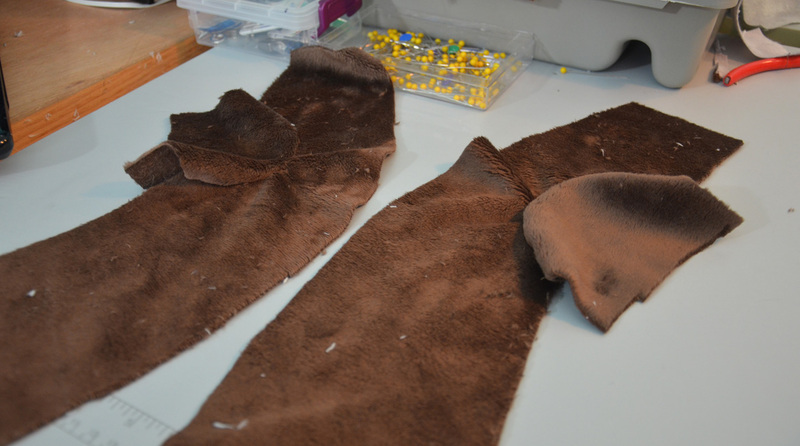 I took a moment to sew the legs onto the body of my pattern. 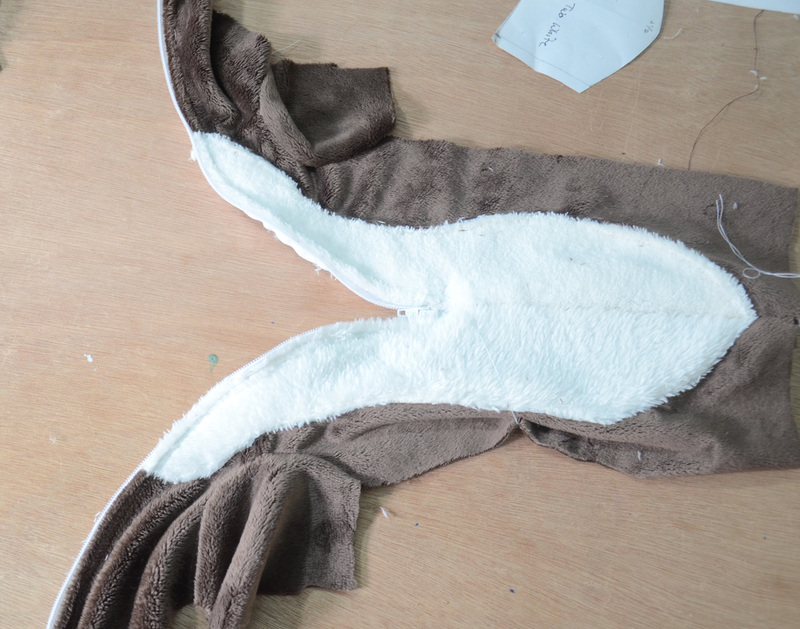 And then the markings got topstitched down. 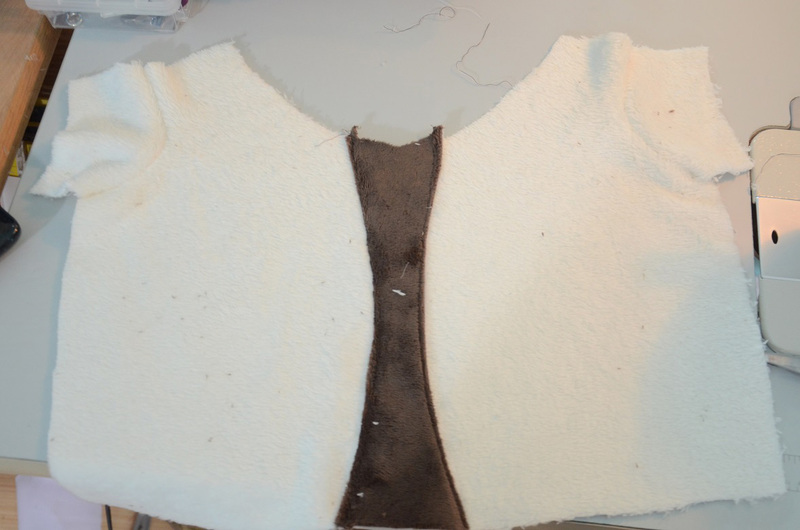 The stomach piece was stitched up half way, then a zipper was inserted. I sewed on the brown neckpiece, then did a fit test. It came on and off with great ease and Guin didn’t seem *too* bothered by it, so that was good. On the downside it was too loose on the bottom, but I fixed this right afterward by taking in the side seams. Then I moved onto the hood. 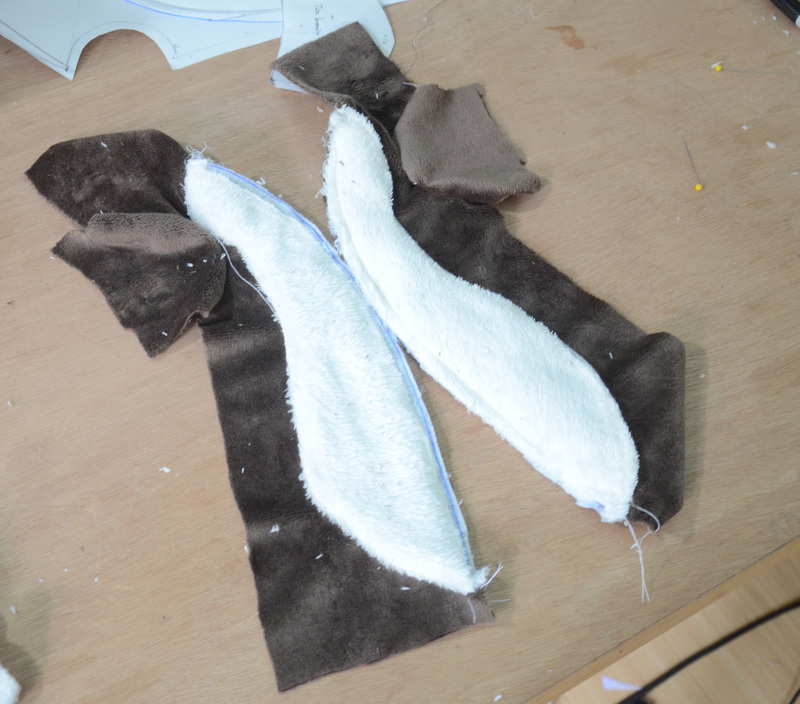 The ears alone have more pieces and are more time consuming to make then the entire body of this costume. It’s quite silly. 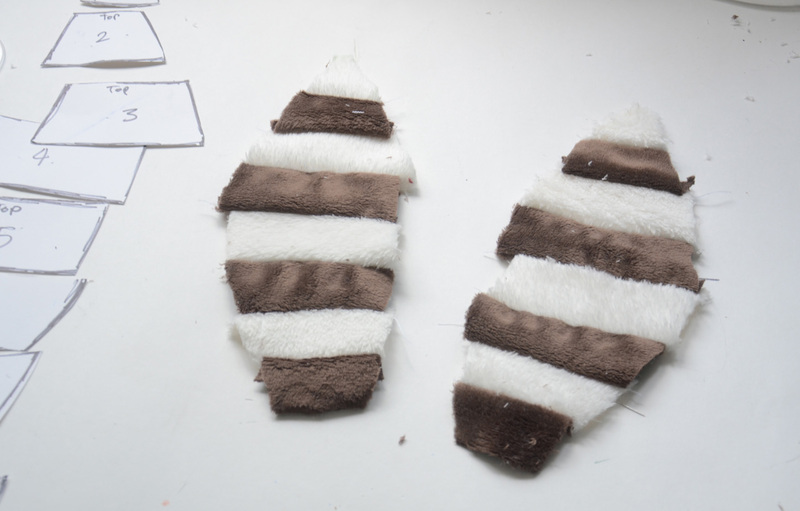 The striped bit of the ears are made up of 8 very tiny pieces of fabric. Then the ear front gets stitched on. It looks like this in the in-progress stage. 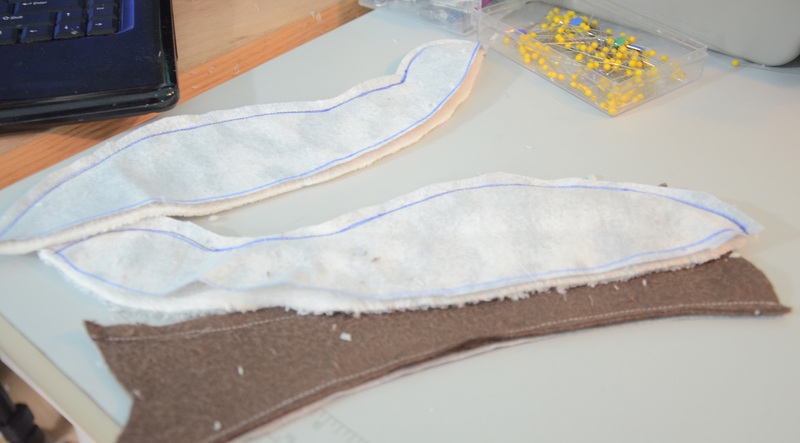 Then they get sewn right-sides-together onto a smooth backing. 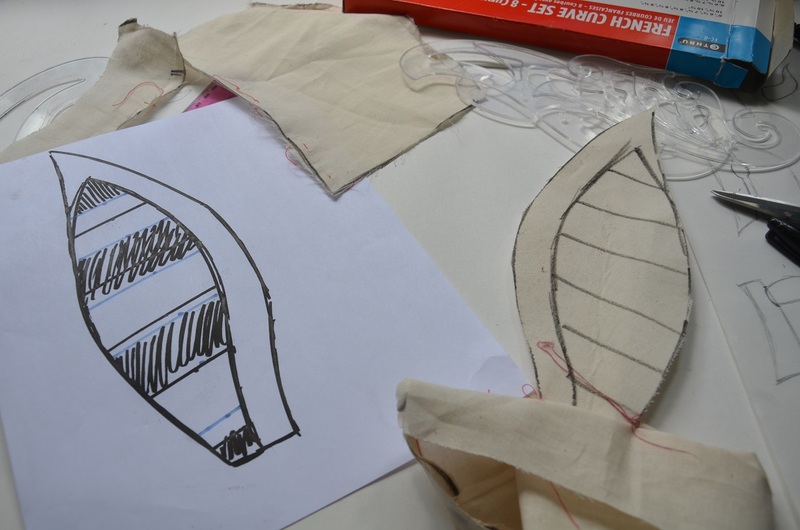 They are sewn into the hood, and loops of boning were added to make them stick up. The tips were sealed with fleece so they wouldn’t poke Guin at all. 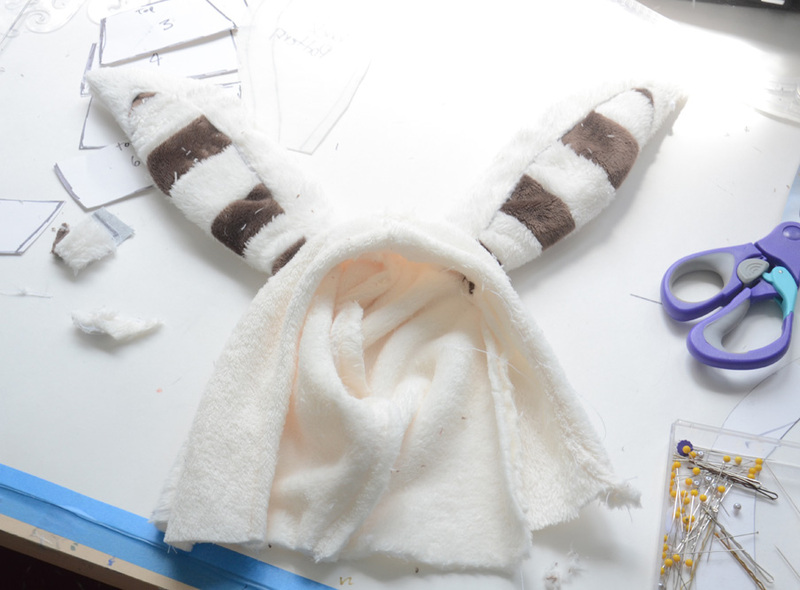 Once it was sewn on I had an adorable Momo hoodie! It isn’t fully complete in these photos, it’s missing the band around the hem, but that was finished up shortly after. A fun project if you have a few hours on hand! 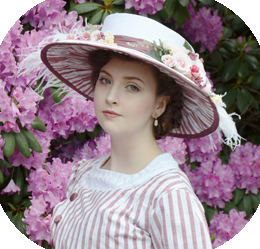 I shall attempt a photoshoot with our coordinating costumes in the near future. We cannot believe that we found this! 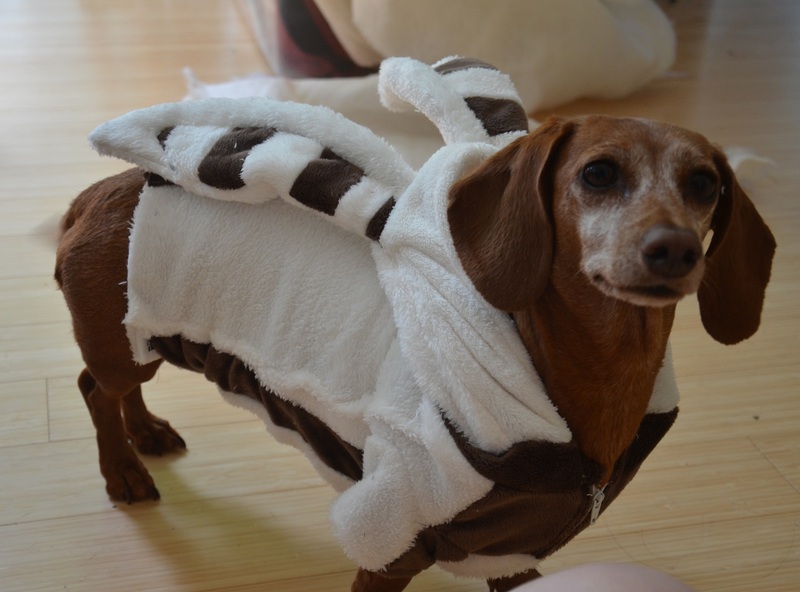 We were just trying to come up with a costume for your Shorkie to be Momo. Unbelievable. And this was so well executed. Thanks for sharing it!